Karl Lagerfeld’s ‘Love It Light’ Collection. True Fashionista Now > Uncategorized > Karl Lagerfeld’s ‘Love It Light’ Collection. 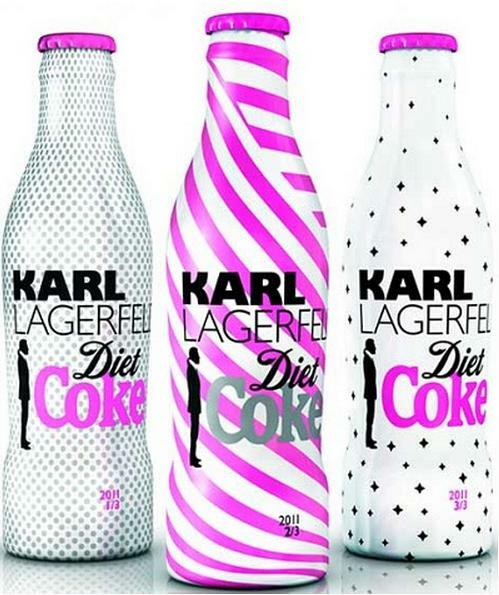 Coke will never be the same again as Karl Lagerfeld unveils the three new bottle designs from his Diet Coke collaboration titled “Love It Light.” This makes good business sense for Coca Cola to cash in on consumers who love Diet Coke. It seems Coca Cola’s strategy is to attract the demographic who wants their fashion and drink it too. Mr. Lagerfeld himself has claimed to lose over 90lbs by going on a diet that consisted of stewed vegetables and these beauties. The collection is expected to be available in June 2011 this summer. #SPFW – Sao Paulo Fashion Week: Osklen Summer 2013.